I posted a new video the other day about some new changes in my bedroom. Theses changes are not major, but it is exciting to walk in and see them come alive. Something I find very enjoyable is working with what you already have. 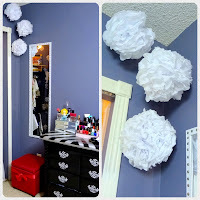 In this case the mirror, ottoman, and tissue paper were set in place somewhere and now they are happily together. The Ottoman - I received this as a gift randomly one day from my Mister and it has probably one of the most used pieces in my room. Something that bothered me about it...it looked SO boring. My bedding came wrapped in this pink ribbon and so I re-used it and just tied it onto the foot stool (even though I do not use it for my feet). Funny story, the ribbon actually matches the ottoman exactly. 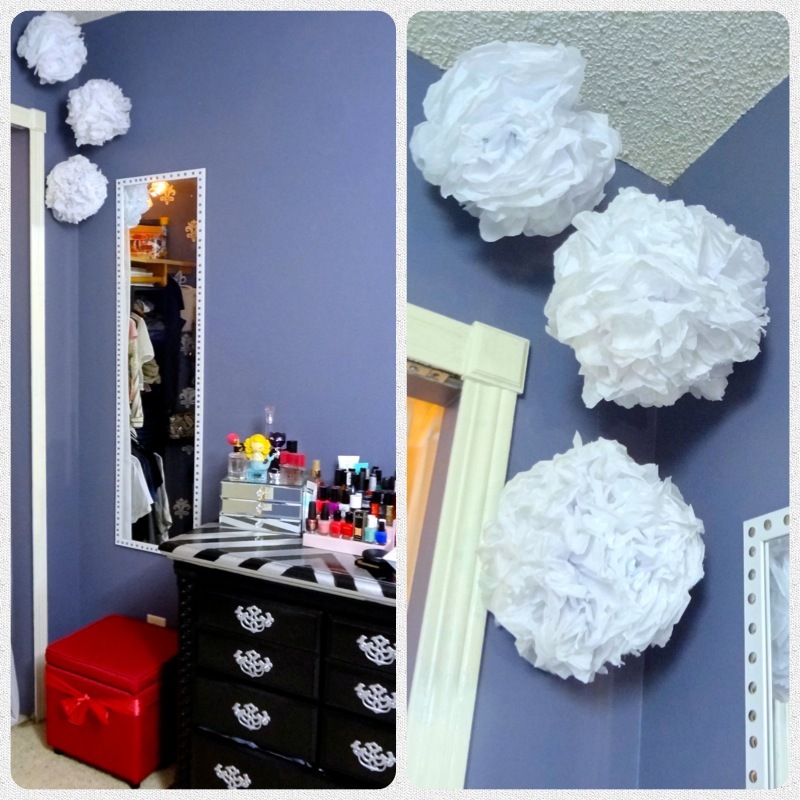 DIY Paper Poofs - Something I recommend making have to these! They are so versatile for decor, parties and obviously they're SO cute. I found a video randomly on Youtube and made a couple to match my infamous pendant light fixture (Click Here for this Project). I used fishing wire, which is every inexpensive, to make it appear that the are floating in the air. A few days ago my beloved lights (as seen here in my dated closet tour video) broke somehow and I did the manliest thing I could and changed the fuse...TWICE and still no luck. The next day I went to target and bought really cheap christmas lights ($3) and simple pinned them as if they were my old ones and stuck the original shades over the top of every 3 bulbs. I actually like how they look now then I did before just because there is this added twinkle effect. I hope this was of use to all, good night! If you would like to see the room in action the video is down below!